This month's edition of the Handover Carnival, entitled "Passion", has been published over at Notes from Mosquito Hill. The posts make for incredible reading, so as soon as you have a few minutes to spare, make sure you head over to Mack505's place, and take the time to see what it is that drives so many of us to do the job we do. I beg your indulgence, just this once. This is not an ambulance based post, but a personal one. This is a very rare show of emotion, and no-one will be more surprised to read it than those who know me best. If you choose to wait for normality to resume, feel free to skip this one. If you stay here and read on, thank you. I'm a grown man. Not necessarily grown-up, but definitely grown. I'm a father, an older brother. I have a life of my own, a family of my own. I'm supposed to be the responsible adult around. A responsible job, caring for other people. Holding their lives in my hands at times. And yet, I am still a child. All that I am, I am because of, not despite the fact that I am that child. At least, I am the adult product of who that child was. That child who was taught always to care, and learnt it from first-hand experience. That child who was provided with all the warmth and attention one could crave. That child who, throughout their life, received all the support one could ask for. Good ideas applauded, bad decisions discussed. Life choices, career choices, always welcomed and embraced, be they expected or not. I couldn't have, wouldn't have, asked for it to be any different. Today, every day, I am thankful for it all. Today, every day, I am grateful for it all. Today, I am dreading tomorrow. Tomorrow is the second anniversary. Tomorrow, especially tomorrow, I suspect that for a while, I'll revert to being that child. Tomorrow, just for a day, I'll spend a while in reflective thought. Tomorrow, just for a day, just for a while, I'll be a Mummy's boy again. When I was a kid, I used to love a funfair that wasn't too far from where I lived. It had all the rides you'd expect. A roller coaster and a ghost train for the slightly more adventurous, a merry-go-round for the little kids, and bumper cars for the kid in everyone. There was always one room I avoided. The room that had the weird mirrors. You know the ones, they distort you and make you look too fat, too thin, too tall, too short, everything other than reflecting the true you. However, I have never seen quite an obvious case as this one. The evidence, barely hidden, included a row of suitcases covered in a couple of sheets, the wheels just visible where the camouflage effect failed to meet the ground. There were passports standing in a sloping mass, with no attempt made to conceal them from us, just from the patient. Summery clothes all still sitting piled high, ready to be packed. The door to that room was rapidly shut as I came in. And the patient, elderly, frail, possibly not long for this world, reclining in his favourite chair, barely a care in the world. And definitely not a lot wrong other than old age. Certainly nothing acutely troubling. The diagnosis is simple. Granny dumping. This is where the family decides that they need a holiday from caring for their loved one (or unloved, as the case may be), and rather than make arrangements such as other family members, or perhaps respite care, they take the easy option. Make up symptoms such as acute confusion or worsening mobility, and get them shipped off to hospital. By the time the hospital staff call for the next of kin, the great blue beyond will be just outside the aircraft window, somewhere over the Atlantic. So the patient is stuck with nowhere to go, and a cheap hospital option for babysitting. I'm fully aware of the fact that being a full time carer for an elderly relative is draining. It's time-consuming, and often involves huge sacrifices. I know that the government could be doing more for the people who care for their elderly, infirm or disabled relatives. Granny Dumping is a little like that room of horrid mirrors. It's a warped and twisted view on the world, and it's totally unfair on the patient. The only difference between those mirrors and this case, is that it does reflect one truth. It reflects the true person behind the dumping. It's a sad reflection too. Even if you put the seat belt around you both. Even if you hold on to her as tightly as you can. Even if you think you're only driving down the road. It's a stupid thing to do. When we come to get you out of your car. When we have to cut the roof off, and you out of it. When we think that a five-seat car only has five passengers. It's a horrible thing to be proved wrong. As the noise of the cutters finally stops. As the chaos of the rescue comes to an end. As the ambulances start to take you all away. It's a dreadful thing to hear your scream. Just when we thought that you were all safe. Just when we thought it was time to leave. Just when we thought that all the harm was already done. It's a moment of horror as we find there's one more. And she lies there, in the foot well, as if she's asleep. And she lies there, in the foot well, no lap keeping her still. And she lies there, in the foot well, killed by the one sworn to protect her. It's then that you realise. But by then it's too late. You must be very bored, sir. Desperately in need of some company, or maybe just some warmth. And whilst I'm at it, you must be very clever too. You know the magic words that will get you the ambulance, and get it quickly. However, you sealed your own fate on being taken seriously before we'd ever turned up. When the computer says that the patient himself has made the call, it's acceptable. If the patient himself says whether he is breathing well, or sometimes not, it's normal. But when the patient himself says that he's unconscious? Well that's just plain crazy. Still, the computer agreed with you. You got your quick response. That too, much like, and possibly much more than your supposed ailment, is just downright ridiculous. There are certain things in this world that I know I do not, can not, or will not understand. 1) Women. But I think that's the same for any man. 2) Children. But I think that's the same for any parent. 3) Smokers. But I think that's the same for any non-smoker. Category 3 has a sub-category. Smokers, who are still smoking, despite the fact that it is close to killing them. And they know it. I know that it was your stressful job that started off the habit in the first place. I know you can't turn the clock back, and not start smoking. We both know that that's no excuse. You know that the inhalers are less effective than they were. You know that your breathing is getting worse by the day. We both know that it's killing you. Your daughter knows that you've called an ambulance, again. Your daughter knows that she has to spend hours with you in hospital, again. We all know that each time could be the last time. Your daughter knows that you should stop. You know that you could stop. I know that you won't. Do you think that your daughter understands? 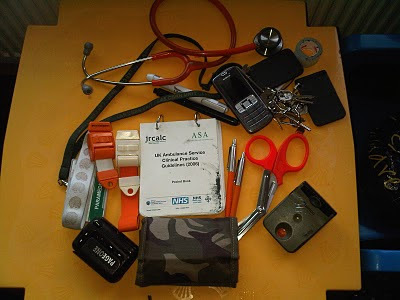 This is what I carry with me on every shift, just in my pockets... Forget about the response bags! Orange steth (in pocket, not around neck a la USA...), orange pens (2, just in case), orange tourniquets (2, just in case), orange scissors (must be 2, 'cos you can't have 1 scissor), orange button on the beepy gadget, even orange stitching on the wallet. I need an orange strap for my ID badge. And if only they made orange tape, keys and pen torches. Ever get the feeling I like the colour orange? The sky is once again dark and menacing. The threat of more of the snow that plagued us a few weeks back is on the not-too-distant horizon. There have even been a few flurries, just to whet our appetite this morning. Not really sure I'm all that hungry. During the last batch of snow more cars crashed, more roads were closed, more people fell and broke limbs, fewer trains and buses ran, and more people couldn't (or possibly wouldn't) get to work. We don't seem to cope with it very well, and now there's more on the way. Someone should probably warn Bernie. He's a nice old chap is Bernie, although when I first met him it was difficult to reach that conclusion, given the fact that he was lying in the snow in a heap, not responding. Another, younger man stood over him, barking orders at Bernie to get up. He even tried to physically lift Bernie from the wintry pavement, but his seemingly lifeless body wouldn't cooperate. It was at that point that I was driving past, on the way back from a separate call. I called in a "Running Call" to the control room, and asked for an ambulance to attend for an unconscious patient. Bernie was unconscious but at least he was breathing regularly. It was one of those shifts where I had an observer with me (told you that they do sometimes get to see things happen), and I sent her back to the car for a couple of blankets. Always handy to have an extra pair of hands, as well as an extra blanket. One to put under Bernie to try keep him off the frozen ground, if only a little, and one to go on top of him. I asked the other man if he was a relative or if he knew what happened. "Never met him before. I just bumped into him and he fell down. Now he won't get up!" He seemed unaware of the fact that he was shouting, much like someone conversing whilst listening to music plugged into their ears. Bumped into him? Staggered was probably nearer the truth. The smell of several pints of alcohol on his breath would probably have made him fail a breath test whilst stood 30 feet from the machine. He instantly became aggressive and I had some difficulty moving him away from the patient and us, so as well as an ambulance, I asked for police back-up. Just in case. Turning our attentions back to Bernie, we'd put him on oxygen, tried to get some baseline observations and elicit some sort of response from him. None was forthcoming. The roads were as treacherous as the pavements, and the call rates had increased exponentially, so we knew that back-up in the form of either the ambulance or the police may take a while. Just as I'd finally managed to get one arm out of a sleeve to check Bernie's blood pressure, he sat bolt upright, the look of bewilderment on his face complemented by the confusion in his voice. "You're on the floor, sir, in NearBy St. Can you tell me your name?" "Hi Bernie. I'm Ben, and this is Shelly. We're from the Ambulance Service. What are you doing out and about at this time of night?" "I've just been out for lunch. Now I'm going to meet Jerry. Where am I?" And there, in one discombobulated sentence, the repeated question, the lack of time awareness, was our main problem. Was Bernie confused before the fall? Did he know where he was going when he left his house? Did he ever get there? Was it the fall itself that left its mark in the form of possible concussion? More importantly, did he fall, or did he collapse? We tried to keep him still, but he kept threatening to get up off the floor and walk off. We compromised by Bernie agreeing to move as far as the back of the FRU. At least it was light, dry and warm in there. The ambulance turned up, closely followed by the police, each to deal with one customer. We handed the once unconscious Bernie to a slightly disbelieving ambulance crew, and the once aggressive drunk, now sitting on the floor shouting at nobody in particular, over to the equally disbelieving police. I apologised to both for the call not being exactly as it had originally been described. Bernie was moved into the ambulance, where the observations were repeated, the questions reinforced, but the confusion remained. The police had no reports of any missing person, Bernie couldn't remember where he lived, although he was adamant that he was going home, and the crew spent a while convincing him that hospital was the best option. At least for now. At least until he doesn't have to wander the snow-covered streets in the middle of the night. At least until we can find out more than the fact that his name is Bernie. The curse is well known. You can be busy as anything for days before, then on the day itself, nothing happens. Closely followed by something happening, but it'll be very mundane, dull, even boring. It is the Curse of the Observer. I've had many observers out with me over the past few years, some on a Vanbulance, and some on the Carbulance, but the vast majority have been the same. Cursed. Not every shift with an observer is so, but it does seem to be more often than not. In fact, just as an illustration, I once had a very eager young lady join me for a shift. She worked for one of the big medical supplies companies, and had travelled from overseas, sent by her bosses, to see first hand how one of their new pieces of kit worked out on the front line. I was one of six people in London trialling it. She spent eight of the twelve hours of my shift hours with me and we did nothing. I mean nothing. We didn't see a single patient for the whole eight hours. Later that afternoon she had a flight to catch, so I dropped her off at a train station, and off she went. Moments later I was called to a hanging, and she missed exactly what it was she had come to see. I also had another few calls before the end of the shift, all of which requiring proper intervention. She missed them all. See what I mean? Cursed. Having an observer has its positives too. It gives me the chance to learn from these people. Often they are medical students, nurses, or doctors. All cleverer than me, and will instantly fall into the trap of being asked a million questions about one of the many things I don't know or understand. More importantly, however, is that it gives me the chance to show off. Not necessarily my skills per se, but to show off the world of Prehospital Emergency Medicine. 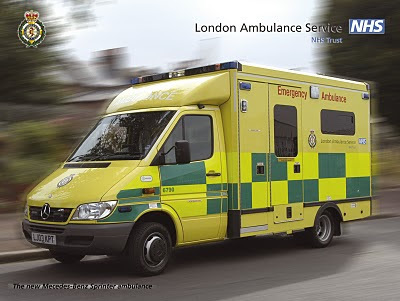 To show how far the Ambulance Service has come in the last few years. To show how we are able to deal with situations that even the best doctor would find challenging. To show off what happens before the patient arrives in the hospital and is presented packaged, 4 foot high, and horizontal. And I love doing it. Now, whereas I do my little bit in this promotion of EMS to the non-ambulance worl d, there are those out there who have gone above and beyond the call of duty, and have started a small revolution. This weekend coming, is the premiere of a production called the "Chronicles of EMS". What started as a trans-Atlantic, glorified shift swap between two of my fellow bloggers, 999Medic from England, and HappyMedic in San Francisco, has turned into a huge project that promises to try to change the Ambulance world forever. The initial idea of sharing and swapping thoughts and working practises between two people, has now got thousands involved through all sorts of media, social and otherwise. The whole concept has taken off in ways that no-one had envisaged. It'll give us all a chance to pool ideas and ideals, to highlight what separates us and, more importantly what we share, and to make us all think about how we can go about improving what we do, as well as how we do it. So as I go on entertaining observers and their curse, really and truly, I should count myself lucky. More than that. I'm not really cursed at all. In fact, I'm anything but. Having been a patient in hospital, and most embarrassingly the one where most of the staff know me, I had the increased indignity of having to wear one of those horrendous hospital gowns. You know the one. It seems that someone else who has suffered the same shame, has decided to do something about it, and has tried to redesign one of the worst pieces of non-fashionable clothing on the planet. Take a look. On a related note - do any of you think that it might be a good idea to start carrying some of these gowns on the ambulances? Has anyone else noticed that it's always the people who we need to monitor the closest, who are wearing the most inaccessible clothing? So what do you think? Should we provide gowns to make life easier both for us and our patients? I met a true hero the other day. Not a celebrity. A hero. Here was a man, who after surviving the horrors of one war, went back to fight another. Not because he wanted to, not because he was made to. Because he felt he had to. He went to defend his Country, his People. Now he was fighting his own, private war. Three wars in one lifetime may be just one war too many. Still, once a hero, always a hero. I know I don't usually use this forum for complaining, especially about the system that I work for. Something about not biting the hand that feeds me. However, at the moment, even I'm getting despondent - not a normal reaction for me at all, and not one that I'm enjoying. There are two main focus groups at work. One is the outlook of the number-crunchers, the ambulance big-wigs, the ivory tower-dwellers, and even the Government office residents. The other, is that of the troops on the ground, the real front line. Slowly but surely, the latter group is falling victim to the whims of the former. Not so slowly, but definitely surely, those troops are being put at greater and more frequent risk by the number crunchers, all in the name of targets. And the troops are not happy. We are being brow-beaten into working faster, not smarter. Responding to the never ending stream of calls as if each was a dire, life-threatening emergency, just so you don't get sued. Activating on calls with all haste, just so you can say that we did. Spending as little time on scene as possible, not treating, just transporting. Turning around at hospital without delay, not for patient benefit, but to stop a countdown. Taking breaks at the times when we don't really need them, just to fill a quota. So, ivory tower-dwellers, come back to the real world for a minute. Let me tell you that if you're managing to depress one of your normally overly positive people, you must be doing something wrong. We're here because whilst we're at work, we want one thing, and one thing only. We want the best for our patients. Government bods: you're expecting us to reach more calls in the state-prescribed magic eight minutes, whilst not giving us the resources to do so. Calls such as flu, panic attacks, coughs and colds, sprained ankles and chronically sore backs all become life-threatening, eight-minute demanding calls. For no reason other than the system said so. And the system is all-knowing, infallible. Law-suit proof. And often very wrong. Big-wigs - it's all well and good sending the call down to the MDT with the barest of bare essentials, just so you can beat the clock. Not even giving an address, just a general direction to head towards. No details of the call. No warnings about the location, if there are any, until many a time when it's too late. Too many times recently, I've walked into a call on my own, only to find out that the crew, who are a few minutes behind, have been told to wait away from the address for the police, as there are threats of violence or other menaces awaiting. Sometimes quick can be too quick. And too dangerous. Oh, and then you throw this sort of stuff at us, just to make it more difficult. If all is going well, and I'm not being threatened by someone drunk, aggressive, or violent, but actually attending a patient who is genuinely unwell, I'm now being told to hurry up there too. Well, you know what, it takes whatever time it takes. Unstable patients are not easily stabilised in the back of a moving vehicle bouncing over every speed bump and pot hole on the way to the local hospital. Stable patients sometimes take time too. We need to spend time making sure that they remain stable. That they have the support they need, that they are well cared for, that they know where to turn if they need to. And I'll take however long is required to make sure that I have done what is best for them, not what is necessarily best for the paperwork. For those who we do transport to hospital, we can't always just dump them and run back out for the next call. Sometimes the hospital is busy. Sometimes the paperwork that you are so concerned about takes time to complete. Sometimes the ambulance needs cleaning from top to bottom, not just the cursory wiping of obvious surfaces. Sometimes, especially on the busiest days, we just need a cup of coffee and a bar of chocolate. It's also on those busiest days, the ones when we most need the break, that we are the least likely to have one. So we may stop at the hospital to grab a bite to eat too. Sometimes, especially on the FRU, where I don't often transport patients, I might not see a toilet for hours on end. I challenge you, number crunchers, to complete a 12-hour day, or night for that matter, with no break for food or the chance of a hot drink, and being at the mercy of a computer screen as to when you're allowed a convenience stop. All we ask, is to be allowed to do our job. To be provided with the resources to help us do it. To use our training, to extend our training, and to put that training to good use. To have the positive support from above, rather than the overbearing threat of a whip. A happy workforce will lead to better results, whether those results are on paper, in the field or even in the overall reputation. We'll transform back from a bunch of glorified taxi drivers into a professional unit of Emergency Medicine Providers. And instead of being resentful, we'll be glad to do it too. And then I can go back to being positive about the job I love. I'd like to ask for your help. Please. There are several ways to garner a history. I normally start with a very simple "do you have any medical problems?" Often the answer is something along the lines of "Not really, I take medicines for those..."
Then begins the sometimes laborious task of locating said tablets, seeing if what's in the boxes is what it really should be, working out which treats what, and when they're due to be taken. Blood pressure, diabetes, cardiac failure and chronic breathing problems, are easily the most common conditions I meet on a regular basis. Then there are the less common. Things like sickle cell crisis, Addison's disease, lupus, and a myriad of other ailments that I either haven't heard of, or don't know enough about, that then I have to go and read up on. Whatever it is, I need to know about it. I admit that if you're in your sixties, and are complaining of chest pain, I don't really need to know about the leg you broke when you fell off your bike 50 years ago, or the fact you had appendicitis when you were in your twenties. However, if you are in your sixties, and are complaining of chest pain, it might be important to tell me other bits of information. Information such as the three previous heart attacks you've had in the last two years. Information such as the fact that this pain feels identical to that experienced in those three previous heart attacks. Information such as the fact that each time, nothing appeared wrong with the ECG, but your blood tests and later angiograms showed otherwise. And most importantly, information such as the fact that on each of those occasions, your heart actually stopped whilst you were either on your way to hospital or once you were already there. That's the sort of stuff we need to know. The important stuff. The sort of detail that may actually help us to help you. Please.